In general, we make a gel coating resin on the surface of custom bumpers, which is a surface layer with high resin content. And it has many purposes. 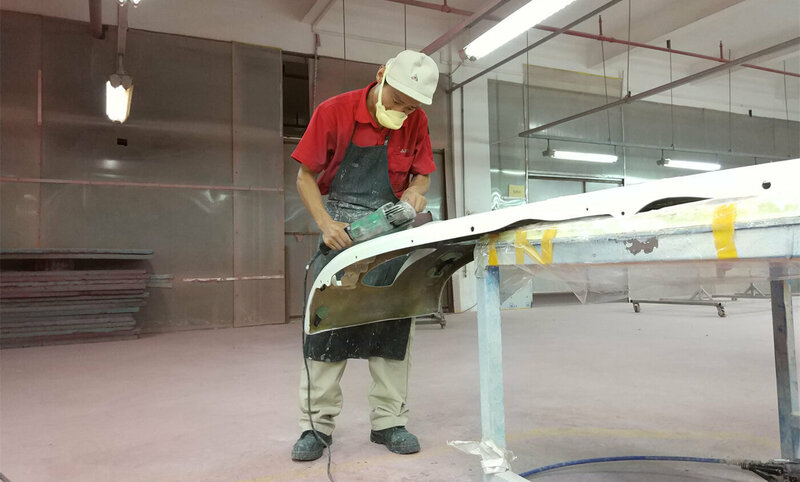 For example, change the surface brightness of the front bumper, improve the corrosion resistance and heat resistance of custom front bumpers. 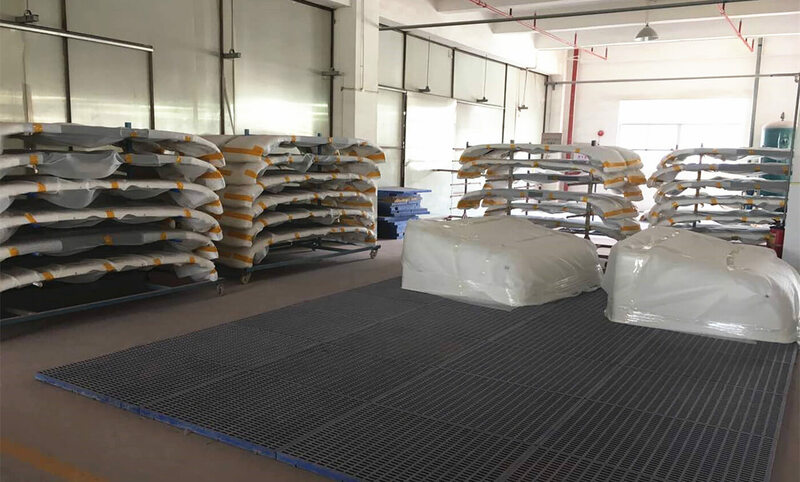 What’s more, it can also improve the water resistance and weather resistance of fiberglass bumper, and prolong the service life of FRP products. 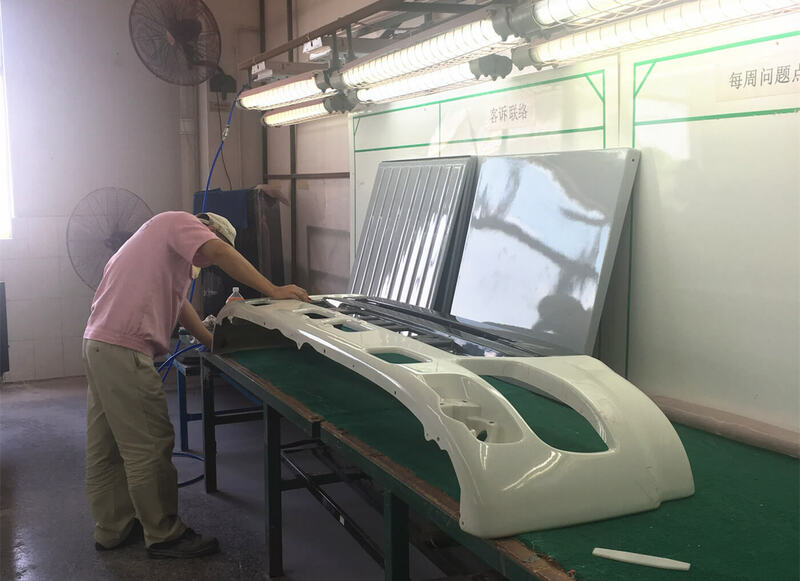 We MIYABI know how to make fiberglass car parts, certainly including how to make a fiberglass bumper. And the gel coat resin is a special resin for the surface layer of fiberglass bumper. While using the gel coat resin for custom truck bumpers, the use amount of curing agent and promoter are the same as those of other resins. In general, the thickness of the gel coat layer of custom rear bumpers is about 0.25mm-0.4mm. That’s 300 grams to 400 grams per square meter. The thickness of the gel coat layer of fiberglass car molds is about 0.5mm-0.6mm. And that is 500 grams to 600 grams per square meter. Because we know how to make fiberglass molds for cars and the FRP molding will wear during use. Of course, the fiberglass car molds should be done a little thicker. The gel coat resin for fiberglass bumper should be brushed twice. And we FRP train interior parts factory should second brush the resin after the first basic curing of FRP fiberglass. The gel coat resin for the best FRP train interior parts should not be too thin. Otherwise, the FRP car parts will not be completely cured. What’s more, the appearance of the FRP material under the gel coat will be revealed. 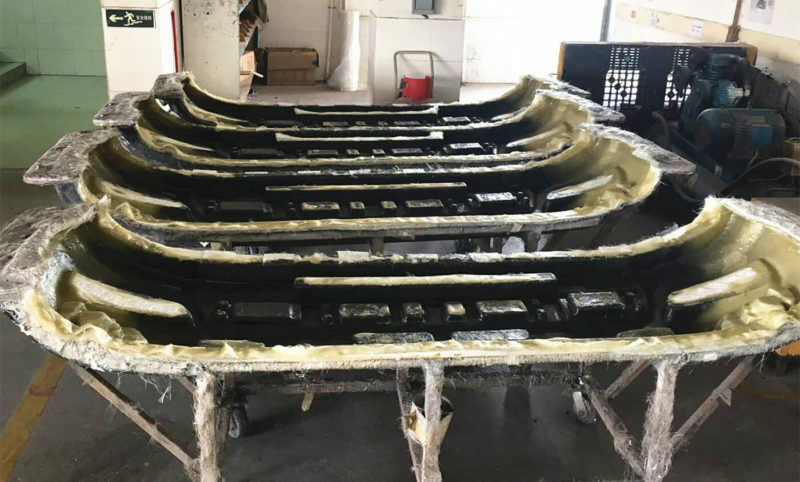 On the one hand, if the FRP train interior parts suppliers China make the resin too thick, it’s easy to crack and break. And the custom off road vehicles will not tolerate the impact force. On the other hand, if you don’t do these FRP train interior parts China evenly, it is easy to cause cracks. Because the surface of fiberglass bumpers cures at different speeds, and it results in internal stress. Furthermore, FRP train interior parts factory can use pure colophony as colophony of glue coat. 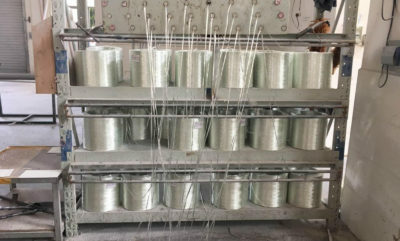 Also, we can use China FRP fiberglass surfacing mat or the surface silk to reinforce. It’s made of various inorganic pigments, which mix with linear resin. And FRP train interior parts factory grinds them with three roll mill. Then, the polyester paste for custom truck bumpers was made after several times of pressing. And it has good mutual miscibility with the resin during custom bumper fabrication. In general, the amount of paste required for custom front bumpers is sufficient as long as the required depth and opacity are achieved. What’s more, the amount of suitable polyester paste should not exceed 10% of the amount of resin in the manufacturing of bumper cars. The function of the release agent is to make the fiberglass parts peel off from the FRP mold smoothly. Of course, it will not damage the custom winch bumpers and the fiber mold. While, the types of release agent for custom off road truck bumpers include floor wax, polyvinyl alcohol in water. Ambient temperature conditions for manufacturing fiberglass parts resin are between 15°C and 25°C. And the relative humidity is not greater than 80%. There are different types and amount of curing agent and accelerator for custom car bumpers. Please refer to table 1 and table 2 to choose them. And the ambient temperature, the FRP products structure complexity and the required GRP molding operation time are also affecting factors. The resin formula for making fiberglass bumpers is as follow. Resin 1001# includes 3-4 parts curing agent and 0.2-2 parts 1# accelerator. While, resin 1002# includes 2-4 parts curing agent and 0.5-2 parts 1# accelerator. As a result, the above data for making FRP bumper are all weight ratio. Before trial producing new FRP GRP composite products, it is necessary to have a test. Then you can determine the formula and the amount of rubber dispensed for manufacturing custom made car bumpers. The greater the amount of glue dispensed, the shorter the gelation time will be. The whole custom bumper fabrication process flow includes these FRP process. At first, FRP molding modification, smearing GRP molding release agent, applying gel coat resin, and cutting glass fabric. Then, glue preparation, paste, room temperature curing, and releasing the FRP mold. Next, removing hair by cutting line, edge banding, curing and spraying fiberglass bumpers. 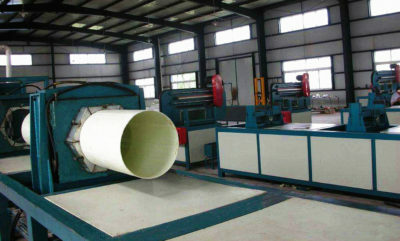 There are many aims to do the FRP molding trimming. For example, making the FRP mold surface smooth, no obvious uneven phenomenon, no hidden bubbles, pinholes and other defects. Fiberglass bumper mold repair: Use a sharp tool to dig out the defects on the surface of the front bumper mold. And place the gel coat with a color which closes to the surface of the FRP molding into the damage place, to make it higher than the surface of the molded fiberglass. After full curing, grind it with a guillotine and water sandpaper to make fiberglass car molds. Then, clean the fiberglass car molds and wipe them with a piece of soft gauze. The surface of custom rear bumpers mold should not contain any impurities. Coating release agent for truck bumpers must be uniform without missing. First of all, you should fully dry the polyvinyl alcohol of FRP train interior parts. 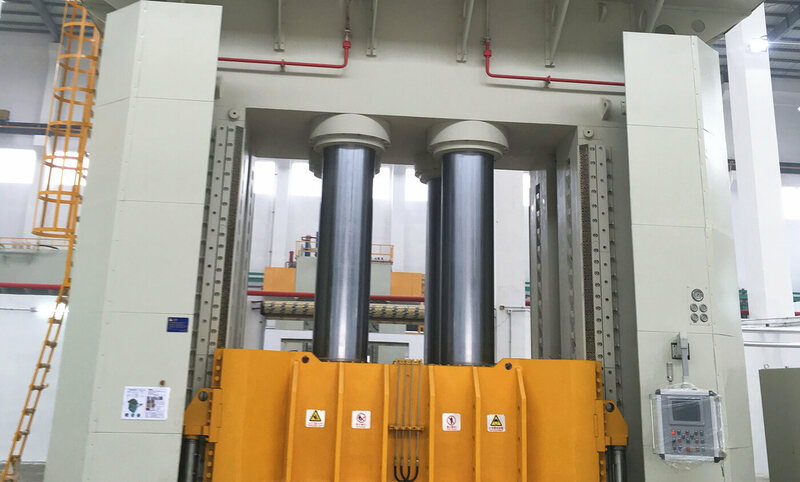 And the FRP train interior parts suppliers China should allow the release agent such as coating wax and non-silicone oil paste to stand for two hours. Of course, it’s to volatilize the solvent during the fiberglass body panels manufacturing. Fiberglass body manufacturers should thoroughly mix the gel coat ingredients. Especially, when using fillers and pigments for FRP body. Uneven mixing can cause spots or streaks on the surface of FRP GRP composite products. And it will affect the appearance of off road bumpers. What’s more, modified car bumpers suppliers should precisely control the thickness of the gel coat. During the construction of reinforced bumper, you can use the brush. When the gel coat for building a bumper is cured, it feels slightly sticky but does not stain the fingers. At this time, fiberglass parts manufacturers can paste layer. According to the size and thickness of the jeep body parts fiberglass, calculate the required number of glass fabric layers. Most noteworthy, the size of the glass fabric for heavy duty bumpers should be slightly larger than that of the fiberglass bumper mold. Then, what is the meaning of FRP? It means fiberglass reinforced plastic. And we MIYABI always use this material to help build your own bumper. If necessary, manufacturers who know how to make custom bumper can use the sample plate to lay off. First of all, custom bumper manufacturers make the weight ratio of the glue and the glass cloth is 55:45. Of course, there are many influence factors of building a custom bumper. 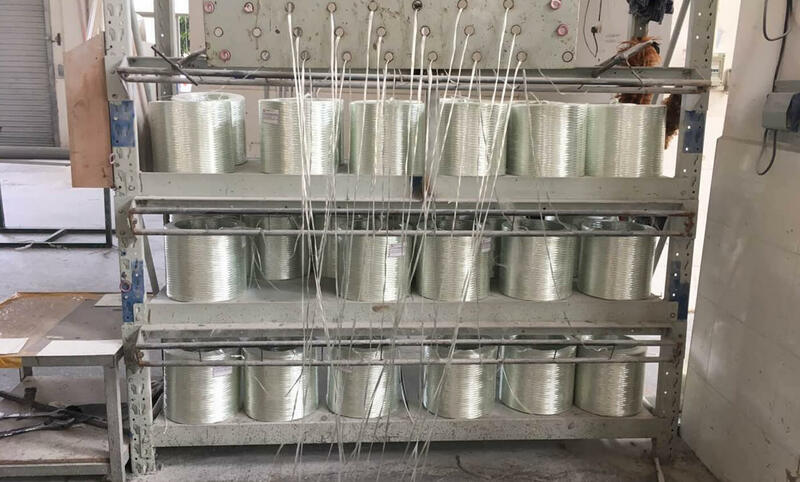 For example, the required gelling time, custom car bumper environmental conditions, the type and proportion of the curing agent and accelerant. If using short cut fiber mats to make your own bumper, then the weight ratio of resin and felt is 2:1. When you need to make color FRP GRP composite products, you can add a small amount of color paste. Apply a thick layer of resin to the gel coat as evenly as possible after car bumper design. Then, spread the first layer of glass reinforcement to build your own bumper, preferably a surface mat or 0.2 mm glass cloth. And, press the resoflex FRP firmly with a brush or roller. So, the resin will easily penetrate the glass fabric during the off road bumper manufacturing. Do not pour the resin of DIY bumpers onto the glass fabric immediately before it is completely saturated. And, use the method described above to continue pasting the lower resin and glass fabric for custom dodge bumpers until achieving the desired thickness. For each layer of paste, custom car bumpers manufacturers should completely saturate the glass fabric. When using a brush for fiber bumper dipping, use a point method rather than a brush on the glass fabric. Note that drain all layers of fabric for building a bumper and the tipping is good. After several tests, ranch bumpers suppliers recommend to use a layer of surface felt and a layer of short cut felt. Then, paste the aftermarket bumpers glass cloth until realizing the thickness of the structure. So it can avoid the fiber pattern through the gel coat layer of custom bumpers, which many affect the surface quality of the auto bumpers. When embedding metal parts, the thickness of the tube bumper should start from the place where the insert is inserted. And, the thickness of the step bumper should not be too thin. When adding stiffeners for aftermarket truck bumpers, it is best to place them directly before laying the last layer of glass fabric. And you should cover the cores with a resin-impregnated glass fabric. And spread the final layer of glass fabric over the entire area of FRP body. After pasting the fiberglass parts, they must stay on the fiberglass car molds for sale. Then, after the staying there for more than 24 hours, you complete the curing period to build your own bumper. Firstly, remove the edge of the custom truck bumpers and then remove the part. As for some fiberglass auto parts that are more difficult to mold, you can compress air between the fiberglass parts and the fiber mold. Use hacksaws or angle grinders to cut the burrs along the edge of the fiberglass car parts. Then, repair the defects on the surface of the custom fiberglass body as shown before. As we fiberglass parts manufacturers all know, the glass fiber is not water resistant. While, the cut section of glass fiber reinforced plastic products is exposed due to fiber exposure. After immersion in water, it can easily cause delamination of fiberglass truck parts and affect the quality of FRP GRP composite products. Therefore, we should seal the edge of the cheap fiberglass car bodies. The method is to use a resin glue for custom off road bumpers, which is equipped with a curing agent and an accelerator. And evenly brush a thin layer of glue on the cutting section of the custom ford ranger bumper. We custom bumper manufacturers should store the demoulded parts for more than one week. And it’s to ensure that we fully cure the fiberglass mustang parts. Also, deformable fiberglass auto parts should be placed on the corresponding molds and cured. In the case of urgent need for custom bumper fabrication, the conditions for storage for one week may be warmed up. Generally speaking, we place the demolded custom fiberglass parts on a fiberglass bumper mold or a mold stand. Then, curing it at 70℃-80℃ for 3 hours, and cooling the truck bumper to room temperature naturally. Finally, the fiberglass camaro parts can be loaded and used only after they are matured. Off road bumper manufacturers should wash off the paint remover residue on the custom fiberglass body panels. And paint according to the desired color of the winch bumpers. 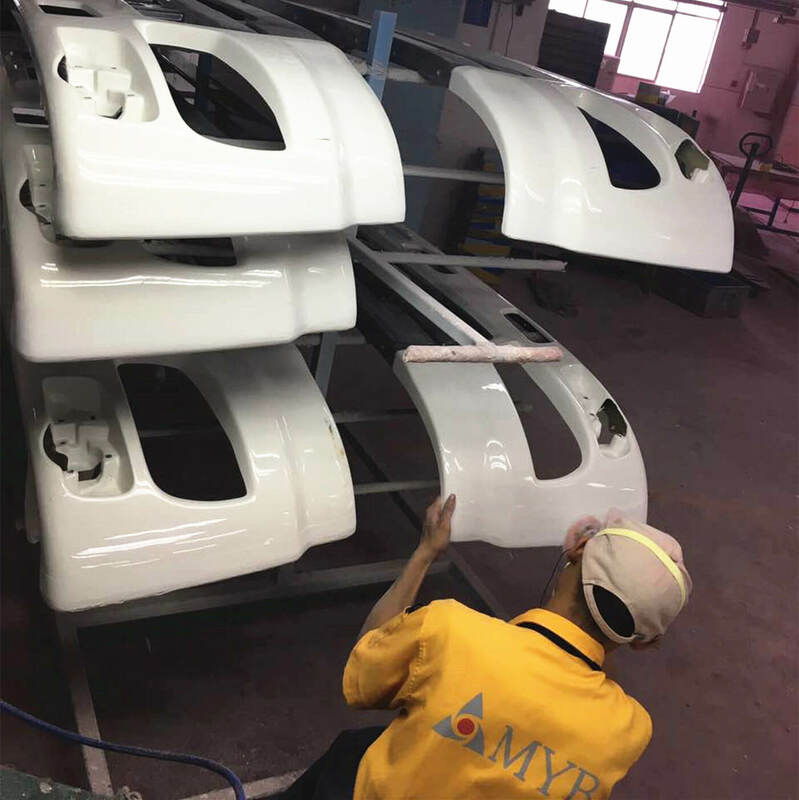 In general, we MIYABI use the low temperature paint for spraying fiberglass bumpers. And the paint drying temperature must not exceed 80°C.